Active Whitehorse News – March/April 2019 | Whitehorse Active Transport Action Group Inc.
With elections in the wind in Australia, negative messages sometimes seem to prevail. We are told how “they” are getting it all wrong so you should vote for “us“! WATAG is far more concerned with the future than complaining about how it’s all gone wrong in the past. Sure, when you use the wonderful “20:20 hindsight viewer“, it’s sometimes hard to imagine how some infrastructure or regulatory changes could possibly have seemed a good idea. But at the time they obviously did- and were implemented! But that was “then“. We think it’s much more productive to consider how we can get from “now” to the “future“. A look at the positive achievements of others can be a good guide to how to get there. With that in mind, in this edition of Active Whitehorse News we have sourced many articles relevant to the developments now happening in Box Hill. Plus other interesting Active Transport themed articles. Ban cars, or just parking? What’s your view (about cyclists)? There are so many possibilities for the future of Box Hill, that “tall buildings” doesn’t begin to describe what the current Whitehorse Council Review of Strategic Direction – Box Hill Metropolitan Activity Centre might lead to. Papsouwselaan in Delft, Holland is a 50 m.wide post-war arterial which has been redeveloped. Whitehorse Rd is 60m wide between Nelson Rd and the Box Hill Town Hall. Imagine the benefits to the people living in, and visiting, Box Hill if this kind of treatment was included in plans for the future. WATAG is represented on the Stakeholder Reference Group for the review of Box Hill. We are strongly advocating for a “street level” CBD for Box Hill…with an environment that suits people’s needs, not cars. It’s people who make cities alive and enjoyable, not cars! Council’s consultants are looking at Box Hill’s current situation, including developments already being built and in the pipeline. Only 20% of approved 16+ story developments have been built so far. Watch how Box Hill grows. Note that Vicinity Shopping Centre development and other future permit applications are not included. Surveys and stakeholder views are being used to develop strategies to manage the effects of what is now an inevitable growth, so that Box Hill can become a desirable place to visit for those who live there and nearby. The city’s imminent new transport plan which will look at widening footpaths and expanding bike lanes. The lord mayor told a Committee for Economic Development of Australia event “Our data shows us that 89 per cent of the trips around the city of Melbourne happen by foot and yet they have 24 per cent of the infrastructure space made available to them. Cr Capp said the strategy would also look at how to stop cars using the city as a thoroughfare. 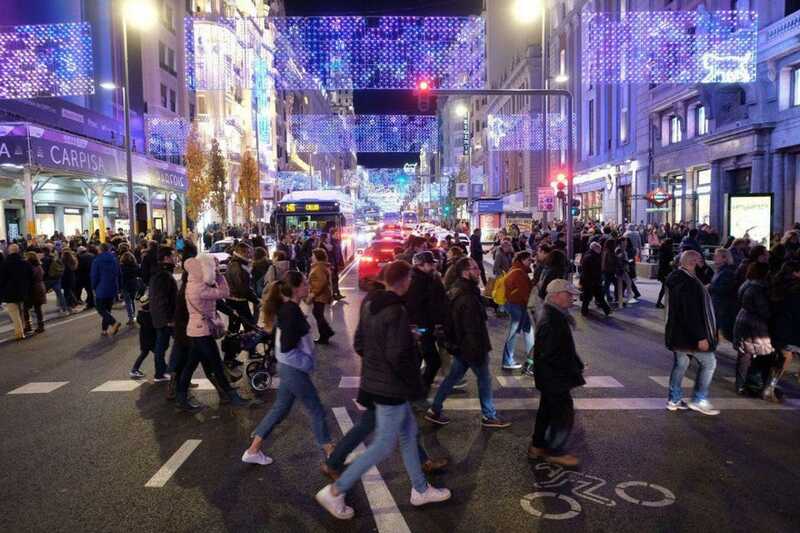 Closing Central Madrid To Cars Resulted In 9.5% Boost To Retail Spending. A report from Forbes.com concludes that ‘City centres that want to boost retail and entertainment revenues should restrict access for cars’. The Dutch are doing it. Amsterdam plans to reduce the number of people permitted to park in the city core by around 1,500 per year in its centre until 2025, making way for bike lanes, sidewalks, and more trees. Who’d have thought Amsterdam – the walkers and cyclists mecca – needed to do more! But only 22 percent of Amsterdam’s journeys take place via car, while drivers still enjoy the large majority of the road space. Most Amsterdam journeys in fact take place by bike, but despite efforts by the city, cyclists are still faced with an eternal scarcity of convenient bike parking spots. By the beginning of this year (2019), the city finished removing more than 700 parking spots–replacing them with bike lanes, plants, tiny parks, and benches–as a major step toward a vision of a car-free city center. The city’s changes are designed, in part, to help improve air quality and fight climate change, but the difference in the quality of life is more immediate. Oslo first pedestrianized some streets in the city center in the 1970s, and invested heavily in public transportation in the 1980s. In 2015, when a progressive political coalition came to power in the city council, they started planning a more significant transformation. At first, they called for a full ban on cars because the majority of residents in the city center didn’t drive. But when business owners objected, worried that they’d lose customers and have problems with deliveries, the government changed focus to remove parking spots–a slightly more gradual approach. For now, there are still parking garages on the periphery of the center. To help support the shift, the city made “massive improvements in public transport and making cycling safe and comfortable,” says Rune Gjøs, Oslo’s head of cycling. The city is adding new trams and metro lines and more frequent departures, and lowering the cost of tickets. For the last few years, the city has also been quickly building out a better-connected bike network, converting parking to bright-red bike lanes. It handed out grants to help citizens buy electric bikes. The city bike-share system has quickly grown, tripling to nearly 3 million trips a year between 2015 and 2018. Click FastCompany to read the full article. This really interesting article in National Geographic is worthwhile studying for an around-the-globe look at the approach taken by many cities to make the movement of people their focus, rather than the movement of cars. This program in Rotterdam is totally inspiring. The Urban Traffic Plan Rotterdam 2016-2030+ sets out an ambition to further develop the Inner City as a City Lounge. It focuses on meeting and staying, with space for pedestrians and cyclists. With Places for People, we are providing inspiration by show-casing projects from abroad and from Rotterdam. Short term actions and experiments that can transform the city in the long term. The Rotterdam Next City approach is the guiding principle in this. The second part of the document will follow up on projects that have been realised in recent years: Inner City experiment programme for 2017-2018. Read the detailed plan by scrolling the window below, or download the pdf here. The Dutch are experts at it – but want even more.The Dutch Government wants to get an additional 200,000 people out of their cars and on bikes. Here’s why. Cyclists spend more in local shops than drivers. Cyclists have an improved life expectancy with a 40% less risk for cancer and a 52% less risk for heart diseases and over 40% less risk for premature death. If we can’t ban cars, lets just ban parking! Canadian City Planner and Urbanist Brent Toderian makes this suggestion and has some positive views on the benefits. Check out some of Brent’s ideas here at his twitter feed. And Brent’s “5 steps to making better cities” makes a lot of sense and is worth reading. We hope you are enjoying Whitehorse Active Transport News for March/April 2019. If you are new to our newsletter (maybe someone forwarded it to you), and you’d like to receive future editions directly every two months, just click here to subscribe to our distribution list. The list is independently and professionally managed by Mailchimp, so it you ever decide to unsubscribe, a click on the unsubscribe button at the foot of the email notification will guarantee your removal. For the last century, streets around the world have been built around automobiles. Wide lanes for traffic and little room for people became the rules of the road in most corners of the globe, dividing cities, stifling economic growth, and creating dangerous congestion. Tired of waiting for regional or national authorities to right these wrongs, a new generation of planners, engineers, urban designers, and city residents are working to take back their streets. Shopping centre Beurstraverse in Rotterdam – Could this be Box Hill one day? For the full pdf (22MB) click here. The study found that more than half of car drivers think cyclists are not completely human, with a link between the dehumanisation of bike riders and acts of deliberate aggression towards them on the road. Norway is currently constructing a 1100km long coastal highway along its western seaboard through extremely challenging landscape. Bridges, floating tunnels and undersea tunnels are being used to traverse this beautiful yet difficult terrain. Stage 1 of the project includes 27km long twin under sea tunnels (each with 2 vehicle lanes) reaching depths of up to 390m below sea level. The tunnel will also have an elaborate mid route under-sea-interchange connecting an island. This video is an inspiration to watch. Note: the $47BN figure shown in the video above is for the 1100km total road project. StordaBridge 1078 m and BømlaBridge 999 m crossing Sagvågsfjord. Norway already provides for pedestrians and cyclists on its major road projects, so it’s expected that this new project will not be any different. The most fascinating thing about this project is the project cost of only 16.8 billion for the 27km Rogfast twin tunnels (the first in a series of crossings) that will link the E39 connecting Stavanger and Haugesund. You might say, that’s almost the same estimated cost of our North East Link project here in Melbourne. Comparing the two projects, it would be fair to say that the Norwegians are getting a better deal than what we are. However the 16.8 billion is in Norwegian Krone which is approx AU$ $2.7 billion for 27 km of undersea twin tunnels. It seems that (like it or not) we are going to have a North East Link here in Melbourne. Perhaps we should invite the Norwegian Public Roads Administration to tender for our North East Link construction so we get top-grade walking and cycling facilities AND a much lower cost? Perhaps both above paths in this photo are desirable? The straight line for going downhill and the curved line for going uphill! You’ve reached the end of Whitehorse Active Transport News for March/April 2019. Don’t forget, if you’d like to receive future editions directly every two months, just click here to subscribe to our distribution list.